store’s security alarm. The company wanted to do something to defend its assets in the event of another burglary attempt. officers reach the scene. They also considered installing shutters but were unhappy with their appearance. together—and in the window frame—when it’s under extreme stress. With this combination, it’s very difficult to break through the glass.” The store’s management team decided to move ahead with the installation of 3M Scotchshield security window film because it provided an inconspicuous way to protect the building. It took about a week to complete the project, which included installing more than 1,000 square feet of film on the store’s windows, sidelights, and doors. 3M Scotchshield security window film also be applied immediately. Windows are, and always have been, the quickest way for people to gain access to someplace they're not supposed to be. And if they're going in through a smashed window, it's usually because time is something they don't have much of. 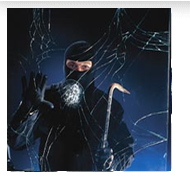 Madico's SafetyShield® 1500 stops these intruders in their tracks. When struck, the glass will break, but not shatter, preventing the intruder from entering quickly, and leaving him wondering what to do next. In most cases, the answer is simple: move on. SafetyShield® 1500 is among the first films in the world to pass the UL972 standard for Anti-Intrusion - making it the easy choice to help secure your home or business from theft and intrusion.